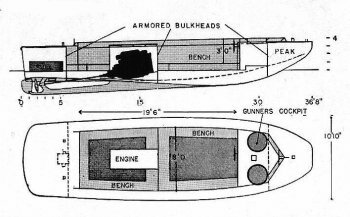 Dimensions 36' by 10'9" by 3'6"
Landing Craft, Personnel, Large was actually a rather small craft, with a very shallow draft, skeg protection for its propeller and rudder, and a strong bow section (a solid pine block) that could be run up over fairly substantial obstacles. One of the earliest Allied landing craft designs, it was based on the Eureka boat designed by Andrew Higgins in 1926. Higgins claimed the Eureka had been designed for loggers and fur trappers in the Louisiana bayous; British historians claimed it was designed for bootleggers (illicit alcohol smugglers) and moonshiners (illicit alcohol distillers) during the era of Prohibition. 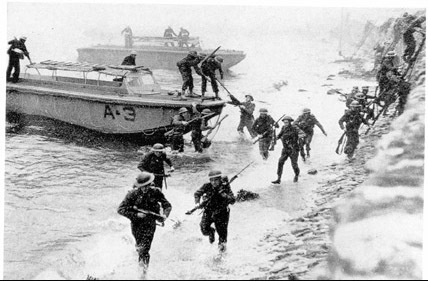 The Marines were interested but had no money for procurement until 1940, when the Navy concluded that ships' boats were inadequate for landing operations and early Bureau of Ships landing craft designs proved unsuccessful. The LCVP had already been produced in considerable numbers for British service when war broke out in the Pacific. Because of its simple design and use of lumber rather than steel, it continued in production even after the superior LCVP was introduced. The following table gives total production. About 30% of this was allocated to the Pacific until the final year of the war, when most of the amphibious fleet began to be shifted to the Pacific.